behind in its atmosphere, and these disappeared completely after several weeks. by the 5-m Hale Telescope at Mt. Palomar, July 1994 (Cornell University/Caltech/Air & Space Museum). 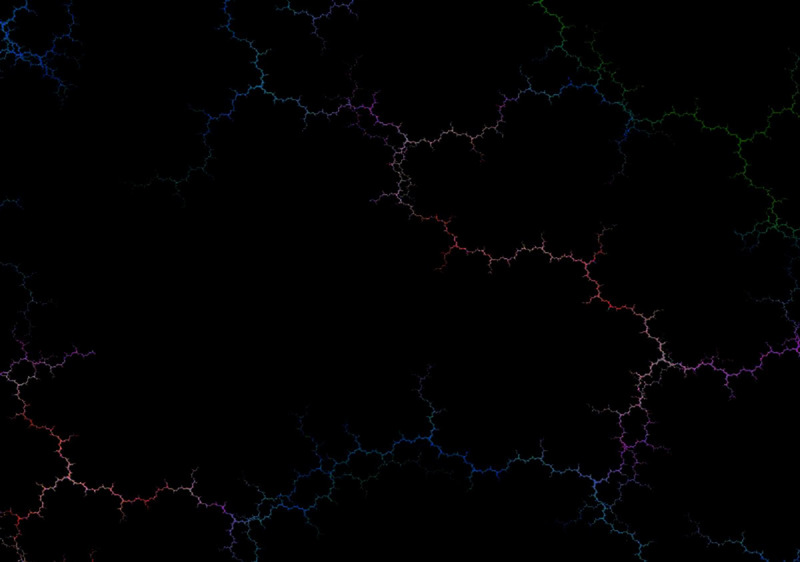 polymorph of quartz, meteoric oxides and water will rain down upon the planet depositing a world-wide dust layer. this time there were also several other very large craters produced. Chicxulub crater in the Yucatan. All three of these craters exhibit impact glasses and ejecta of breccia. ...near Kiev was discovered during oil prospecting. millions of years, if you are wise enough to read the signs. circular structures with raised rims, an area of central uplift and sometimes a peak in the center. undifferentiated crystalline basement rock over a kilometer deep. 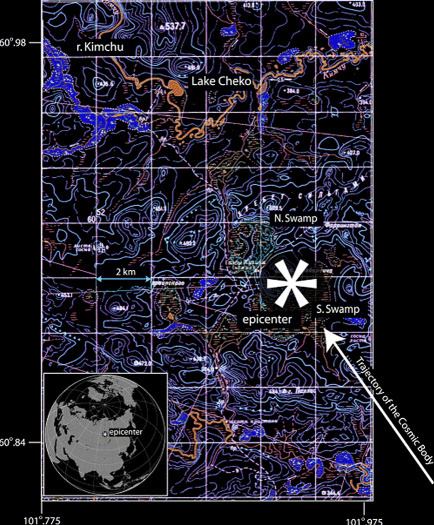 Fig 4: Location of the Chesapeake Crater and it's multiple faults, by Wylie Hoag, Ph. D.
and ropy textured phyllosilicate clasts, which look like altered fragments of glass, both produced by shock melting. Located ~50 km from the crater's center and penetrated ~500 meters of impact melt and breccias at its base. evaporites, recrystallized sandstone, granitic gneisses and mica schists in a carbonate-rich matrix. Metallic iron minerals make up the largest percentage of iron meteorites and stony iron meteorites & chondrites. Plessite--this is not a mineral, but is a mixture of fine-grained kamacite and taenite. Troilite--FeS--Iron sulfide similar to the earthly mineral pyrrhotite. sometimes form diamonds. Canyon Diablo meteorites have some. Lonsdaleite--C--A hexagonal polymorph of diamond (diamond is cubic). Enstatite-- Mg2Si2O6--The end member--the one highest in magnesium. Bronzite-- (Mg,Fe)SiO3--more iron than enstatite and more magnesium than hypersthene. Orthoferrosilite--FeSiO3--This is the other orthopyroxene end member. It has the most iron and the least magnesium. 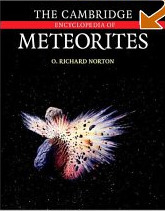 and pigeonite ((Mg,Fe,Al)(Mg,Fe)Si2O6) are also found in meteorites particularly achondrites. containing the most magnesium and fayalite having the most iron. Phylosilicates-- or clays are found in some meteorites. The mineralogy of Canyon Diablo meteorites depends on whether they have been shocked by impact. rim show very different mineralogy. The less altered mineralogy is typical of iron meteorites. Kamacite--this iron nickel alloy makes about 90 percent of specimens. Taenite--the other iron nickel constituents taentie and plessite make up 1 to 4 percent of the material. unfortunate enough to be put to the task of cutting a Canyon Diablo. up about 8.5 % of specimens. Graphite-- occurs as large bodies within iron or in separate masses. Cohenite-- an iron carbide, is common. This mineral is even harder than Schreibersite. Haxonite-- chromite and silicates are also found. move aside when it hits one of these. Millerite is one of several minerals that is routinely found (albeit in scarce quantities) within iron-nickel meteorites. Our next crater of interest is the Silverpit Crater, 80 miles east of the Yorkshire, England coast in the North Sea. impactites and meteorite oxides. Consider the similarities of this far-side Lunar crater below. 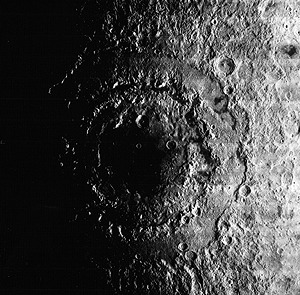 This crater is 12 miles (20 km) wide, with some 9-10 concentric rings stretching from the central peak out almost 10km. Europa, which are on NASA's website in public domain. that Silverpit may be a sinkhole depression caused by salt withdrawal. off the western coast of India, and was made by an enormous impactor measuring 40 kilometers across. Fig 10: Diagram of Shiva impact area. Credit: Sankar Chatterjee. crater in North Sea, and the Shiva crater offshore western India." Many of these structures are some of the best hydrocarbon producing sites in the world. Shiva is one of them. of Neoproterozoic granite (938±13 Ma) that rebounded upward for more than 5 km. bentonite), and tsunami deposits. And finally the K-T clay boundary layer in India is one meter thick- the thickest in the world. the Shiva crater is still a non-peer reviewed hypothesis, but suggests some very tasty hypotheses. Fig 11: Small Point, Maine, cropped to the center of the Small Point Crater off Maine & Mass. in the late Cretaceous. The most distinctive features of the Small Point crater are its topographic and magnetic expressions. Geological Society of America in Halifax, Nova Scotia. arcs that might be ridges of the western part of an eroded crater. Abbott is not giving up any time soon. Rather, she intends to look further south in the Martha's Vineyard area off Cape Cod. There, she is hoping to find impact related rocks of the right age that might have been deposited after the glaciers retreated. The image below displays a striking semicircular alignment or Cenote Ring around southern hemisphere of the crater. elaborate deeply. An excellent new poster from a very long Dutch evolution blog page, including new anthropological fossils. Fig 12: A gravity map of The Chicxulub crater in Yucatan, Mexico. were only flattened out to 40 - 45 km (2150km2). And sent its shock wave TWICE around the world! ...to cause a global extinction event, but still what should be a major wake-up call to GEE's in the future. theories to the cause. Some more improbable, than the adjective I just used. found in the area have been iron-nickel. a obvious peak at 1908, leading to the prediction that the impactor was most likely a stony asteroid and not a comet. major impactors have collided with the earth and done global catastrophic damage, both to biodiversity and geological structures. Kuiper Belt, which contain estimated millions of comet/asteroid sized bodies from the size of basketballs to large mountains. discussed above, many of these conditions are met and gas and oil are being successfully extracted. gas and oil, there is a potential for major discoveries. If we can do it before the ‘next one’ hits. 5-m Hale Telescope at Mt. Palomar, July 1994 (Cornell University/Caltech/Air & Space Museum). 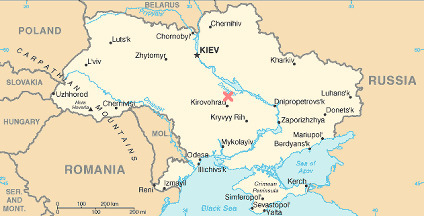 Fig 2: Wikipedia The 24Km Boltysh Crater in the Ukraine, near Kiev was discovered during oil prospecting. on the Moon's extreme western edge, this impact basin is unfortunately difficult to see from an earthbound perspective. of Cenotes or limestone sinkhole which border the southern outer ring of the crater. of North America Geol. Soc. Am. G: DEEP IMPACT Shiva: Another K-T Impact?